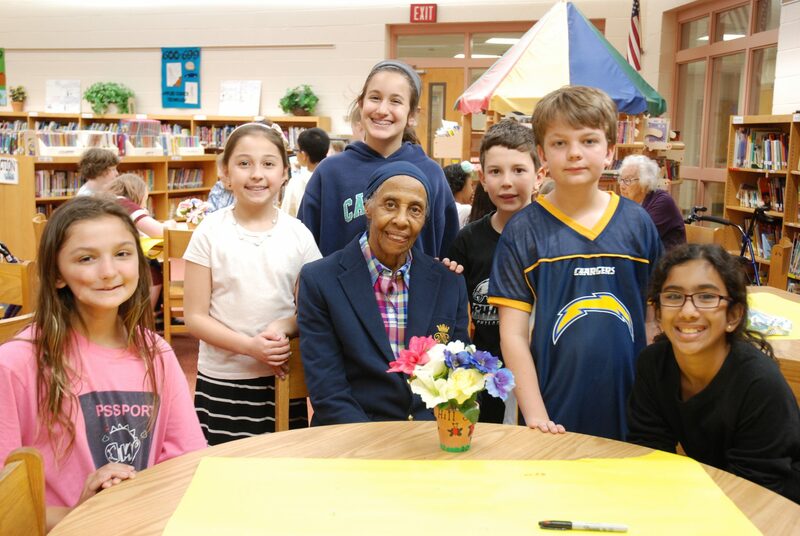 Students from Signal Hill Elementary welcomes seniors from Brandywine Senior Living to their school Wednesday, April 10. Pictured, left to right, is Aami Holmes-Gupta, Sophia Williams, Bella Spalter, Miss Connie, Cameron Goldsmith, Patrick Lauler and Sahaana Bhambri. Bella Spalter helps Miss Connie with decorating a flower pot, using paint on their fingerprints, for seniors to take as gifts to remember their stay at Signal Hill Elementary. Four seniors visited Signal Hill Elementary Wednesday, April 10 to tour the school alongside the Husky Pride Service Team. 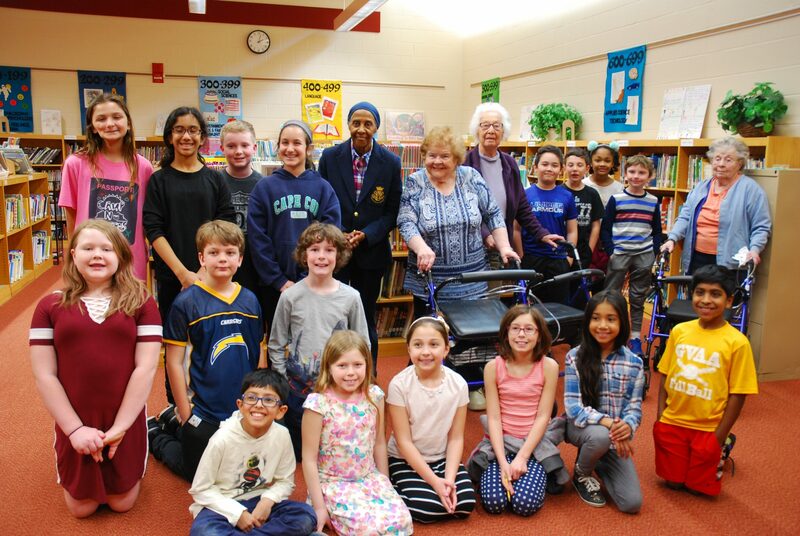 Pictured top row from left, Aami Holmes-Gupta, Sahaana Bhambri, Andrew Morgan, Bella Spalter, Miss Connie, Miss Eileen, Miss Doris, Nicholas Poteschil, Cameron Goldsmith, Makayla Modica, William Salazar, Miss Maggie, middle row from left, Ava Prendergast, Patrick Lauler, Noah Ryan and pictured bottom row from left, Yousuf Hussain, Vanessa Schwartz, Sophia Williams, Aleah Bilgrami, Likhil Gudipati. Students at Signal Hill Elementary School had the opportunity to spend time with seniors from Brandywine Senior Living Wednesday, April 10, in what has been a friendly back-and-forth relationship between the school and the seniors. Students who are members of the Husky Pride Service Team at the school help organize and take part in multiple service efforts throughout the year, shown by the group’s work through Lunches from the Heart and BookSmiles in recent months. However, the group’s latest work dealt with spending time with seniors to connect with them on a more personal level. 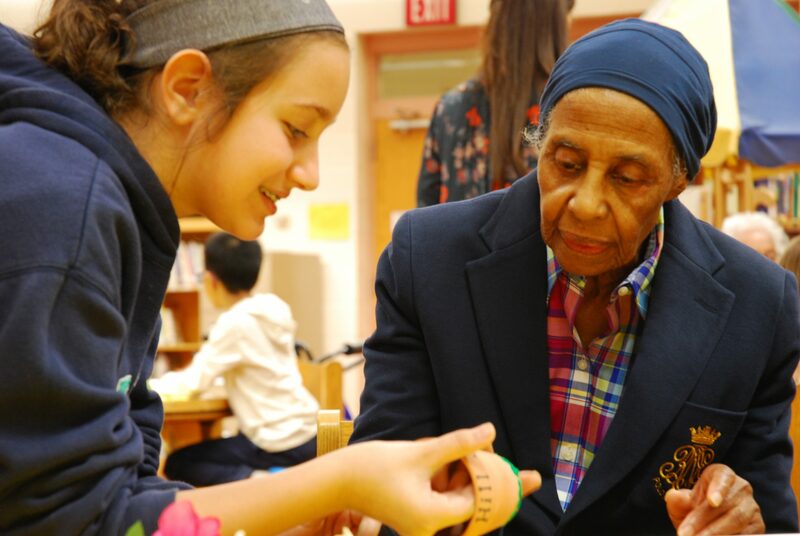 Additionally, the students helped the seniors with a craft, decorating a flower pot using each other’s fingerprints to decorate the pot and making ladybugs, flowers and more with different colors of paint. At the end of the visit, the seniors were able to take home the flowerpots with planted toy flowers to remember their visits with the children. In the past, students have sung holiday songs at Brandywine Senior Living during December, visiting the seniors where they stay. This time, the students were able to be the host. The Husky Pride Service Team is comprised of approximately 20 teachers and 75 students, with a number of the students taking part in the activity this past Wednesday. One of the visiting seniors, Eileen Gessner, came to stay at the home after living in New York state for a number of years. Health concerns caused her to move closer to her children, who live in the area. Gessner said she thoroughly enjoyed the visit to the school and asked many questions to the students about what they do throughout their day or over the course of the school year. “I think it was illuminating for me, because I’m just amazed at all the different projects they do. They seem to be so excited about their classes,” Gessner said. Gessner says she was a huge history buff growing up, and can remember being in grade school during Pearl Harbor, which she says really sparked her interest in history. Thanks to the amount of technology and books or reading material at their fingertips on a daily basis, she says she’s amazed at the extent to which students know about the world around them at such a young age and so quickly after something happens. According to two students, meeting and speaking with the seniors was a fun experience. “You learn a lot about what’s been going in with them and how much stuff has changed,” said Patrick Lauler. Both students say they’ve enjoyed visiting and meeting the seniors through different activities thanks to the school’s service group.